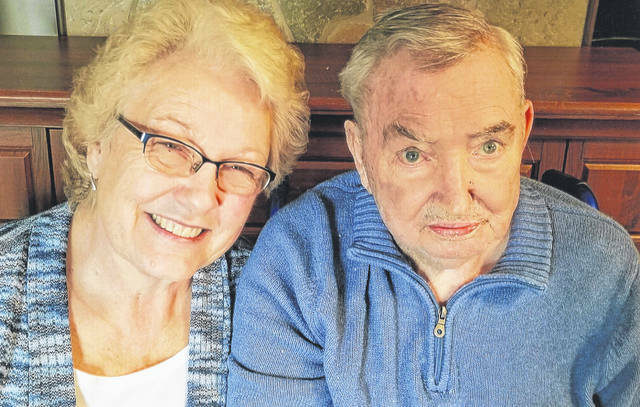 SIDNEY — Connie Kay and Ray Lewis, of Sidney, marked their 55th wedding anniversary with a celebration hosted by their family, April 6, 2019, at the Inn Between in Botkins. Ray and the former Connie Kay Brackney were married April 18, 1964, in the Church of God in Port Jefferson. The Rev. Joe Jackson performed the ceremony on a beautiful day. Witnesses were Roy Lewis and Theodore Coffey. Ray is the son of the late Sarah and Starling Lewis. He has a living sister, Nancy Hecht, of Sidney; a living brother, Roy Lewis, of Toledo; and a sister-in-law, Mary Lewis, of Sidney. Two other sisters, Betty Hamilton and Addie Huges, and a brother, Willard Lewis, are deceased. Connie is the daughter of Marjorie Brackney, of Port Jefferson, and the late Wilford Brackney. She has a sister, Linda Valentine, of Rosewood, and two brothers and sisters-in-law, Roger and Rosa Brackney, of Peculiar, Missouri, and Ray and Sue Brackney, of Sidney. The Lewises are the parents of three sons and two daughters-in-law, Ray Jr. and Christina Lewis, Robert Lewis, and Tony and Tina Lewis, all of Sidney. They have eight grandchilddren and 10 great-grandchildren. Connie retired in March 2015 from Coleland after 42 years of service. Ray retired in 2002 from Colepland with 33 years of service. They are members of Full Gospel Community Church. They enjoy going to church and spending time with their grandchildren and great-grandchildren.